How will we know if it’s the right decision? What happens if one skips and the other one doesn’t want to? What about the fact that one daughter doesn’t seem to be particularly fond of school? She’s not even getting top marks. What about my perfectionistic daughter? Will it be too challenging for her? What about socially? Are they mature enough to handle a skip? Will the school be amenable? How do I even initiate the process of discussing acceleration? Should we be concerned that there are equally bright students (perhaps even more advanced) in their current classes? They do have peers. Shouldn’t they simply stay where they are? Will they feel too much pressure? Is this just a novel idea that will wear off when the work seems harder? What about learning gaps? What happens if they don’t know what they’re supposed to learn about Colorado history and/or certain science requirements? What if they start and then hate it? Thankfully, we got all of these questions answered and then some. Between Dr. Linda Silverman, Barbara (“Bobbie”) Jackson Gilman, and Kim Boham at the Gifted Development Center, we not only discussed each question thoroughly, but we also learned an extraordinary amount about research on acceleration, how vital it is for the students to initiate the idea (not parents), and how to advocate with the school to ensure the best possible outcomes. Many of you have asked me to share a bit more about our experiences. I’m going to simply provide a brief summary. As you can imagine, every child is different, and every school situation differs as well. This is not meant to be an exhaustive testimony on acceleration, but rather an example of how it unraveled for one family – ours. My hope is that you may resonate with some of the questions and/or concerns we had and learn a bit more about how to explore this option. Comprehensive assessment and testing is essential. We were fortunate to have both girls tested at the Gifted Development Center in Denver, Colorado. We started with a Needs Assessment. 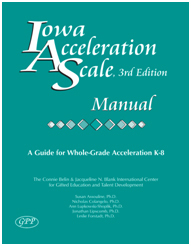 Then, the measures administered included the Wechsler Intelligence Scale for Children – Fourth Edition (WISC-IV); Woodcock-Johnson III Tests of Achievement (WJ-III ACH), Self-Perception Profile – Ages 8-12, “What I Am Like”, Gifted Development Center Emotional Inventory, Characteristics of Giftedness in Children Scale, Introversion/Extraversion Continuum, Behavioral Checklist, Short Sensory Profile, Overexcitability Inventory for Parents (OIP). This is only a sampling of the tests/measurements available to families; these represent the customized recommendations based upon our girls’ Needs Assessments. Having a psychologist who specializes in gifted learners is essential. Both our girls felt an immediate rapport with the testers. Given we have an introvert and an extrovert, I was delighted. Such camaraderie helped make the entire experience much more enjoyable. Both girls had fun, and my oldest even said, “Why can’t school be more like this?” Moreover, the amount of experience and discernment such experts bring can have a significant impact on the quality of the evaluation, recommendations, and consultation. Proper assessment gives parents a clear picture of their student. As someone who is admittedly controlling, I thought I had a pretty good read on my girls. I was actually aghast upon looking at their WJ-III scores. “Really?” I thought. I was also surprised to hear some of the comments they both had made to their testers about school. Afterwards, we felt as if we had new lenses on, which would help us in the years to come. Parents can discover hidden learning disabilities and/or minor glitches. We learned that both girls had small tracking issues with their vision, something that often goes undetected in regular eye exams. Both girls received referrals for visual-therapy. Parents of twice exceptional students benefit particularly from comprehensive assessments such as this. The post-test consultation was worth its weight in gold. I found myself shaking my head in amazement as I learned new insights about their personality types, their strengths, nuances, outlooks on life and family, views on school, needs, and passions. The Psychoeducational Evaluation we received allowed us to initiate discussions with our girls’ school in an ideal manner. Together with the Psychoeducational Evaluation provided by the Gifted Development Center, this tool accessed additional factors. After the specialist discerned that both girls were, in fact, good candidates, he scheduled a meeting with the school principal, the assistant principal, the school counselor, the District’s Gifted and Talented Coordinator, and our entire family. We sat down in July with this group at the school and had an informal discussion about what the girls wanted and their concerns. Both girls readily stated they wanted to do a whole grade-skip. After discussing specifics, including dd10 going into Middle School instead of 5th grade, we came to a final decision. In the weeks following, we had several conversations about next steps. It was then that the GT specialist suggested our dd10 take the end-of-year 6th grade Math assessment. Based upon her Woodcock-Johnson III scores, he and the principal thought she might benefit from a double-acceleration in Math. After taking the test, she was given the option to go from 4th grade math directly to 7th grade math; she chose to give it a whirl. We’re now several months into the school year, and I must say, the grade skips have had such an extraordinary positive impact on both girls. We’re fortunate that the receiving teachers welcomed the girls with open arms and understanding. The principal, GT teacher, GT coordinator, and counselor proved so supportive and insightful. The adjustment has been much smoother than I anticipated. DD10 has confidence navigating the halls of middle school and has made good friends. She even went to her first dance right before Halloween! DD09 has finally gotten comfortable with not immediately knowing the answers in class and is developing much more of a growth mindset. She says this is her favorite year of school by far. I realize we’re fortunate. Not all administrators and classroom teachers are familiar with the empirical research on acceleration. My hope is that this post might open a few minds. There will always be those who argue, “But you’re giving up a whole year with your kids!” and “They won’t have their driver’s license at the same time as other kids.” I feel more calm about our decision than ever. Thanks to the experts at the Gifted Development Center and the girls’ school who guided us, I’m now aware of the dangers of not grade skipping students with certain profiles. Breezing through coursework without being sufficiently challenged and potentially losing interest in school altogether can prove debilitating – and even toxic – later on in life. Here’s to promoting a love for learning with no limits. Here’s to the psychologists, gifted specialists, and administrators who take the time to learn about the research and the cognitive and social-emotional needs of these learners. You’re impacting our collective futures, and I, for one, am utterly grateful.